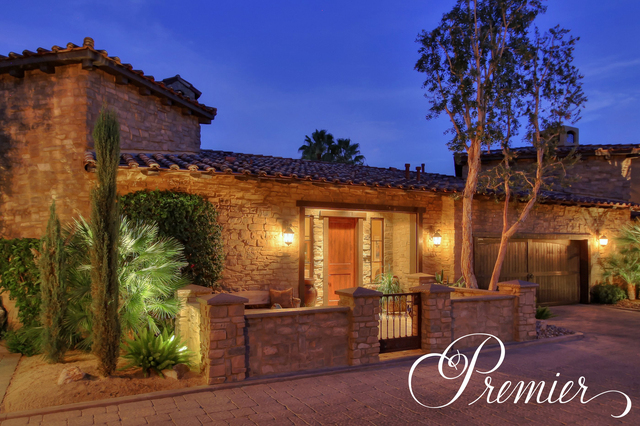 CUSTOM BUILT ON A DOUBLE LOT, THIS MAGNIFICENT SINGLE-STORY HOME IS 1 OF ONLY 4 CUSTOM BUILT HOMES IN "THE VILLAS IN OLD PALM SPRINGS. " From its cul-de-sac location, this warm retreat offers a taste of Tuscany. French doors from every major room usher you outdoors to the large beautifully landscaped private back yard and outdoor living room - ideal for entertaining friends and family. The casual confort of the European lifestyle radiates from the inviting great room with dramatic 14' beamed ceilings, striking solid-core doors, beautiful hardwood flooring and a remarkable 14’stone fireplace. The spacious gourmet kitchen features high-end stainless appliances, slab-granite counters and exceptional cabinetry. There is a wonderful separation of all three bedrooms, allowing maximum privacy. The grand master bedroom suite offers French doors escorting you to a natural stone terrace. The luxurious master bath with extraordinary detail to mosaic tile and walls of travertine includes a walk-in closet with custom built-in cabinetry, dual vanities, private water closet, large oval Jacuzzi-style soaking tub and a separate frameless glass enclosed shower. There are two additional bedrooms suites, each with their own private bath and walk-in closet. Secluded at the foot of Mount San Jacinto, The Villas in Old Palm Springs present a gated village community enjoying an exclusive location in the heart of the city. Lush landscaping and open piazzas seclude the 2 swimming pools, 3 spas, Bocce Ball Court and amazing BBQ area – ideal for larger gatherings.